Welcome to St. John Chrysostom Church located in Fort Wayne, Indiana. Our parish is a congregation of the Antiochian Orthodox Christian Archdiocese of North America, a part of the ancient Patriarchate of Antioch. The Christian Faith taught and practiced here is Orthodox, originating in the teachings of our Lord Jesus Christ as revealed through Holy Scripture and by the Church that was founded on the day of Pentecost. Father Michael and the parish welcome you to inquire about the the parish or the Orthodox faith. We look forward to having you visit St. John Chrysostom Church. 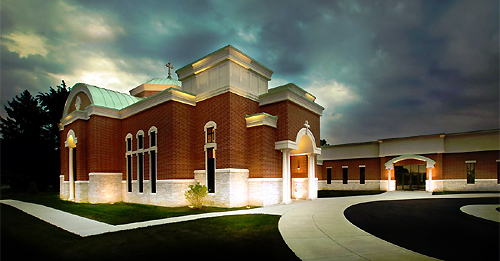 The sanctuary at St. John Chrysostom Church was consecrated by His Eminence Metropolitan PHILIP on September 19th, 2010. A celebration was held that weekend to mark the full preparation of the church. The parish of St. John Chrysostom undertook a “new beginning” in the life our the church on August 5, 2007, when we approved the construction of our new facility with sanctuary seating for 200 people, church school classrooms, office space, and a fellowship hall that serves as a meeting place for our church family. The first Divine Liturgy in the sanctuary of our church was served on March 14th, 2010 by Bishop MARK along with Father (now Bishop) Anthony Michaels and Father George Smith.